located in the heart of Forest, Virginia. The store's original founders, James and Joyce Falls, began the business under the name Quality Towel and Linen, and served the local area as an outlet store for towels and bedding where their three daughters worked also. Her daughter, Cindy (the current owner), eventually helped to expand the business to incorporate window treatments as well. 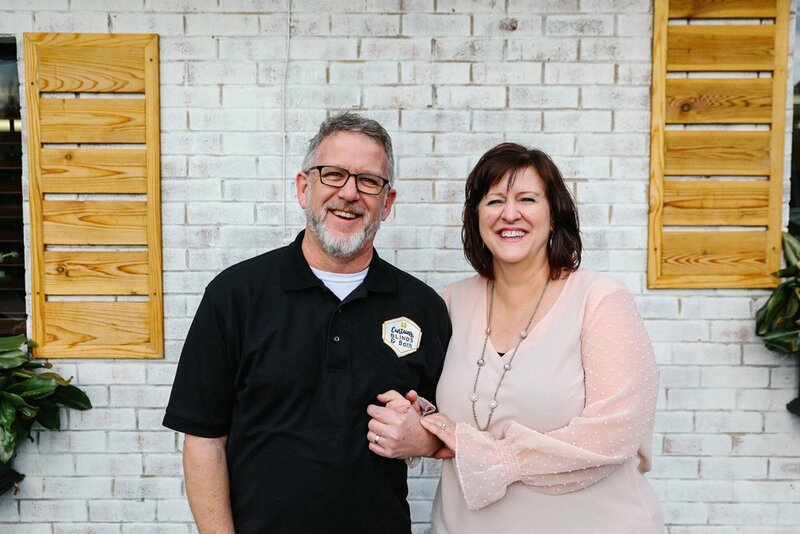 After Cindy and husband Brad purchased the business in 1994, they revamped the store and introduced the blinds and shades. With a new-found market and expanded focus they renamed it Curtains, Blinds & Bath. Since then, the business has introduced in-stock, high-end ready-made and custom window treatments as well as custom blinds, shades and shutters. Brad and Cindy's children have since started working at the store, keeping the business a family affair! Cindy is the amazing, dedicated, and talented owner of Curtains, Blinds & Bath. Interior decorating is one of her many passions and it shows through her work with clients! A Lynchburg native, Cindy purchased the business from her mother in 1994, after working in the original business since she was 21 years old. Cindy re-vamped the recently acquired store and began offering a custom line of window treatments and expanded with demand to bedding, shower, and more. Due to such a high demand for in-stock unique items for the window, she has been able to expand her product lines to encompass more than she ever imagined! With over thirty years in this industry she has helped to make many homes and businesses beautiful due to her critical eye and attention to the most finite detail! From helping customers in the store, to personal consultations, and simple furniture re-arrangements, Cindy is the leader of her team and enjoys all of her jobs from concept to creation. Brad is the co-owner, business master mind, and one of the most talkative team members of Curtains, Blinds & Bath. A North Carolina native, Brad moved to Lynchburg when he was in high school. He worked and commuted to the Washington D.C. area for multiple years until he and his wife Cindy purchased the business together in 1994. Due to his ingenuity and desire to bring quality product at discount pricing to the Lynchburg area, he developed the blind and shade aspect of the business. Now accounting for a large portion of sales, their ability to incorporate this industry into the soft decorating end makes Brad and Cindy a strong duo to beat. Brad's knowledge of the blind and shade industry is extremely vast and no job is too small for him! A 2010 graduate of Virginia Commonwealth University in Richmond, Virginia with a B.A. in Fashion Merchandising, Ashley is no newbie to the world of fashion and decorating. Living in London, England she had the opportunity to intern for a large fashion Public Relations company where she helped merchandise showrooms for clients such as: Diane VonFurstenberg, Victoria Beckham, Vince, and more. Her time at Brower Lewis PRCo allowed her to work the Betty Jackson show during London Fashion Week, which led her to co-direct the annual 2010 VCU Fashion Show hosted at the Virginia Museum of Fine Arts. Ashley has been working full time at Curtains, Blinds & Bath since September 2010 and has been the mind behind many new lines and products you will find at the store. She has taken over the much of the marketing and advertising for the store, so you will see her work in many local publications. Utilizing her creativity, she thoroughly enjoys her time merchandising the store and bringing in beautiful, unique products for the customers. Sharon began her career in Interior Decorating while living in Charleston, South Carolina. Originally from Amherst, she has taken many different routes in her life including acquiring her undergraduate degree from Lynchburg College with a B.A. in Sociology. Later pursuing her studies, Sharon received her Masters in Health Services Administration from The Medical University of South Carolina. Sharon has had many different careers including owning an interior decorating franchise business of her own, which she began in 2000. Sharon began working for Curtains, Blinds & Bath in 2007, after moving back to Lynchburg to be closer to family. She enjoys taking on challenging jobs and customers with unique situations that would require her expertise! Thoroughly enjoying traveling, her love for interiors is reflected in her impeccable styling of her clients' homes. No stranger to Curtains, Blinds & Bath, Mady is Cindy and Brad's youngest daughter and has worked on and off here for eleven years! Growing up around the shop cultivated her love for interior design which led her to study design in college. She holds a B.S. in Interior Design & Fashion Merchandising from Liberty University and is a professional member of the national Interior Design Society. In addition to working at CB&B, Mady works with a local builder in the design process of house flipping as well as staging the homes to sell. She has also worked at West Elm in the heart of D.C. as an In-Home Stylist. She pioneered West Elm's internship program as their very first intern companywide. Because of her time at West Elm she has knowledge of all types of custom and ready-made furniture and is our resident Industrial and Mid-Century design expert! Additionally, Mady leads our commercial projects team. From pre-project planning to installation, she’s there on the job working with the best of Lynchburg’s business’, architects and construction companies. When not out on a job, you'll catch Mady working alongside the rest of the crew in the shop! Lynchburg native Lloyd Wilson has been mastering the arts of many crafts and trades throughout his life. His perfectionism, great southern charm, and personality have made him a very desirable and qualified professional installer! Working mainly in custom cabinetry throughout his adulthood, Lloyd has dealt with products that will be under the utmost scrutiny and has developed a keen eye, especially for the challenging yet breath taking plantation shutters, which do require a skilled craftsman's touch to make them just right! Lloyd has been with Curtains, Blinds, & Bath since 2009 and enjoys every aspect of his job, from something simple, to the tricky shutters, and of course the drapery end of installing where his superb skills come into play! He represents the company in one of the most important ways as that is typically the last memory they will have and will then be able to enjoy the product. Lloyd enjoys spending time with his wife, son and daughter in his free time, and please ask him about his family because he loves to brag about them (as he should)! Spencer began working in construction with his grandfather when he was just 8 years old. He has since worked roofing and commercial construction and has been working alongside our lead installer for over 4 years. He is now our second full time installer where he uses his skills and lifetime knowledge of window treatments to be able to install just about any product. Spencer is Brad and Cindy’s youngest and he holds a certificate in welding from CVCC. In his free time you can catch him around town where is he the drummer in a local band! This lovable pooch is our store dog and let's face it, the only reason some of our customers come in! He's Cindy & Brad's most spoiled "child" and gets to come to work with them most days. He's here most days, and when he's not, he's at doggie daycare with his friends. Be sure to give him lots of loving next time you stop by!